A Lynchburg park will soon have documentation of the birds that call it home—thanks to a Randolph College student. 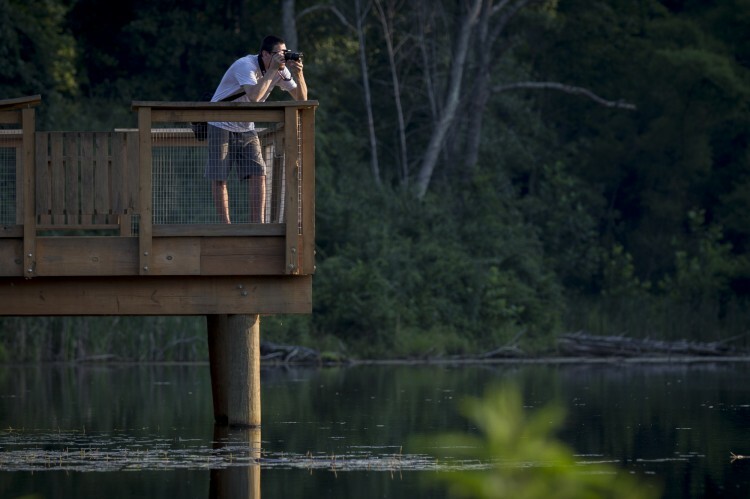 Tristan Luxner ’15 spent part of his summer trekking through Ivy Creek Park with a camera and listening for bird calls. “I can isolate a lot of bird noises, and I can pick out ones that I am familiar with and not familiar with, and judge which way to go,” he said. When he has a bird in sight, he shoots—with his Canon EOS Rebel T3i camera. Then he uses that picture, along with his memory of the call the bird made, to identify it. “I’ve definitely developed a set of skills that have helped me track and observe birds at the closest distance possible,” Luxner said. His bird tracking began earlier this year when he requested a Randolph Innovative Student Experience (RISE) grant. The RISE program allows students to apply for up to $2,000 to pay for equipment, materials, travel, and other costs to support research and creative works. 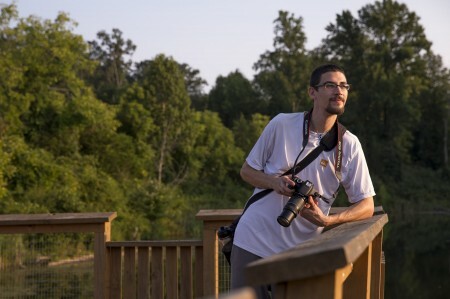 Luxner used his RISE award to purchase a camera and lenses to assist him in documenting the species of birds that find their homes on the Randolph College campus. During the spring semester, Luxner walked throughout the Randolph campus, including the developed portion of campus as well as the forestland behind, to track and photograph birds. With some help from Doug Shedd, the Catherine Ehrman Thoresen and William E. Thoresen Professor of Biology, he identified more than 60 species of bird on campus. “I got close to some pretty rare birds,” he said. For example, he was able to get 20 yards away from a broad-winged hawk behind the soccer field. 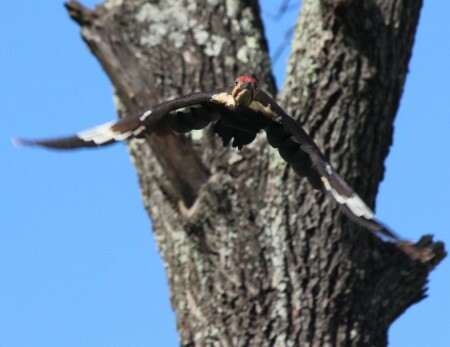 He also found a male woodduck, a vibrantly colored and rare duck, and a pileated woodpecker. At the same time, he was taking an ornithology and mammalogy class from Shedd. The RISE project and the class worked together to develop a new interest. “That really sparked something. That’s what I want to do,” he said. This summer, Luxner completed his internship at Ivy Creek Park by helping build and maintain trails. When that work finished, he proposed repeating his bird identification project there. To date, Luxner has identified more than 30 species at Ivy Creek Park, including a green heron and a great blue heron.